Located in the centre of the enchanting landscape of Pustertal and Eisacktal Valley, Hotel Alpenfrieden is an idyllic paradise for hikers and nature-lovers. Enjoy the warm hospitality of our house. Welcome to Hotel Alpenfieden*** in Meransen! 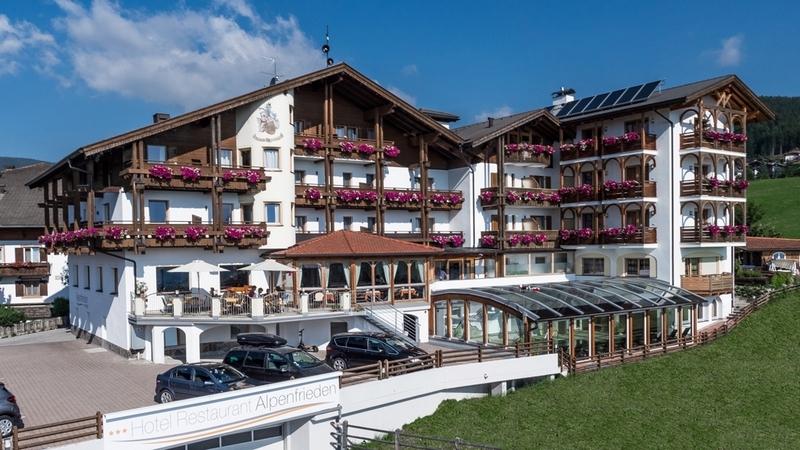 Hotel Alpenfieden*** is situated in Meransen on the foot of the wonderful hiking and skiing area Gitschberg. This is the ideal place for families, nature friends and lovers of sports in the free nature. Our rooms are spacious, cosy and have a wonderful panoramic view on the surrounding mountain world. All rooms are furnished with bath, shower/WC, hair dryer, TV, phone, safe and panoramic terrace. Before you start in your ski day or to beautiful hiking tours refresh yourself with our delicious breakfast buffet. In the evening we love to spoil you with Mediterranean and Tyrolean dishes. Our Wellness oasis invites you to relax and recover. The swimming pool with whirlpool, the sauna, the steam bath and much more will offer you moments of relaxation. In summer and in winter Meransen offers you many outdoor activities. Walking, mountain biking, playing tennis, swimming and much more is waiting for you. You will have fun on the ski slopes in the skiing area Gitschberg- Jochtal, which starts in front of our house.